A pulsating second half at Victory Park saw Chorley rescue a point against a lively Boston United team. In fact but for a series of top-class saves by the visitors’ keeper George Willis the Magpies would surely have emerged with all three points from an increasingly compelling contest which ignited a crowd of 1,047 on a damp and dreary afternoon. Boston were not a side to be underestimated, dominating the opening half-hour and taking a deserved lead in the 31st minute. 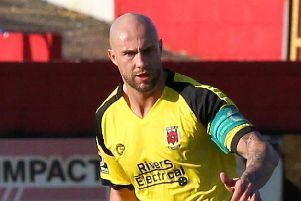 Not for the first – or last-- time Chorley surrendered possession carelessly in midfield and a quick through-ball released Nicky Walker who left Matt Urwin standing with a powerful finish. Willis had earlier pulled off two great saves, first from a well-struck Adam Blakeman free-kick and then denying Louis Almond with an instinctive block when the striker was given a clear run at goal. The Boston skipper had to be even more alert after the break as Chorley finally got their act together and mounted sustained pressure. They duly equalised on 58 minutes from a well-flighted Blakeman corner. A posse of players converged on the ball in the six-yards’ box and it appeared that Courtney Meppen-Walter had bundled the ball into the net but the goal was later officially credited to Almond. Buoyed by the goal, Chorley continued to threaten and Willis made two outstanding saves from Marcus Carver, following incisive play down the right. Almond and Alex Newby combined to set up Carver whose terrific drive was tipped over by Willis at full stretch; then Adam Anson squared the ball to Carver10 yards out and with a clear sight of goal he apparently could not miss – but Willis stuck out a leg and a faint touch diverted the ball inches past the post. But it was not all one-way traffic. Boston were always quick on the break and forced several corners without seriously testing Urwin. They were however unlucky in the closing stages when a 35-yards’ snap-shot by Andi Thanoj shook the bar with Urwin clawing at thin air. In the end, after being off the pace for much of the first half, the Magpies could be grateful to have earned a point and to stay second in the table. CHORLEY : Urwin, Anson, Blakeman, Teague (Hooper 86), Meppen-Walter, Jordan, A. Newby, O’Keefe, Carver, Almond (Wilson 86), E.Newby. Unused subs. Whitham, Cottrell, Lussey.